Vettel extends his lead at the top of the Driver Championship with a great drive to hold off the charge of the two Mercedes. A frantic race became a battle of the strategies as the teams approached the race in a variety of ways. Ferrari were originally on a three stop race but after Mercedes switched to a two stop it meant Vettel had to nurse a set of soft tyres for 39 laps when Pirelli thought they would last a maximum of 30. 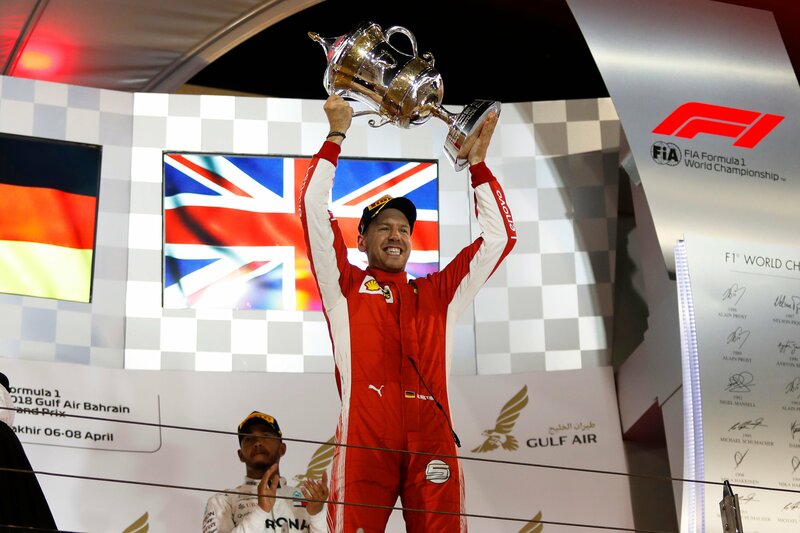 With track temperatures dropping as the race went on Vettel was able to get to the end of the race and take the chequered flag. If Vettel needed to pit he would have come out behind Bottas and Hamilton who came from 9th to get on the podium. The Silver Arrows will be happy with a double podium after a difficult weekend for the team. Both drivers had good races with Bottas getting very close to Vettel in the last few laps and Hamilton putting on a masterclass when taking 3 cars in one corner. It could have been very different when Verstappen and Hamilton had contact on the 2nd lap as they both tried to work their way through the field. Verstappen came away with a puncture and damage which eventually ended his race. Both drivers blame each other but the stewards called it a racing incident and I tend to agree. If anyone was to blame it would probably be Verstappen who didn’t leave enough track for Hamilton to make the corner. As Verstappen slowly made his way round to the pits with the puncture he passed the stricken Red Bull of Ricciardo which had stopped on track with a power failure. A miserable weekend for Red Bull who were very optimistic coming into this race. The other Ferrari of Raikkonen also retired as a failed pit stop ended with the Finn being released too early and a mechanic being hit. The mechanic was taken too hospital with a double leg break but is recovering well. Pierre Gasly put on a driver of the day performance as he announced himself to any of the big teams that might be on the lookout for a driver next season. After a stunning qualifying performance on Saturday he carried the form into Sunday and claimed 4th for the Toro Rosso Honda partnership. Magnussen gained some redemption and good points for Haas following the debacle in Melbourne as he claimed 5th proving the teams impressive pace. While McLaren recovered from a very disappointing qualifying to get another double points finish with Alonso in 7th and Vandoorne in 8th. Just below the McLaren’s were two teams managing to get their first points of the season with Ocon in the Force India claiming 10th and Ericsson in the Sauber claiming his first points since 2015 in 9th. Hulkenberg made up the top 10 with another solid and consistent performance to take 6th for Renault. With Williams now the only team not to score a point it is troubling times for the historic team. I’m sure they will get chances as the midfield continues to chop and change adding further proof of the intense battle brewing below the big 3. There are no clear favourites for 4th in the Constructors Championship and it’s all to play for going into China next weekend. 2004 was the last time Ferrari won the first two races of the season which went on to be dominated by Michael Schumacher. I don’t see Vettel being as dominant this year but it’s another encouraging start for the Prancing Pony. Only time will tell if the team and Vettel can keep their head when Hamilton inevitably applies the pressure.